I love this book. Along with Lootens it's my favorite on this page. Toward the end of the time I was doing darkroom work, I started getting into making my own chemistry. One of the beauties of B&W is that there is no standard formula to process it, unlike color (C-41, E-6 and the like); you can do all sorts of things to B&W film and get different effects. 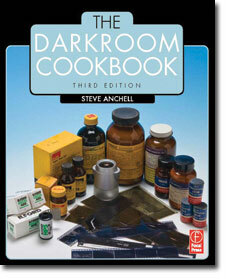 In fact, B&W darkroom chemistry is a lot like baking; you can bake a cake from a mix and you get that cake; or you can buy the basic bulk ingredients: flour, sugar, eggs, baking powder, and make several different kinds of cakes. Add another couple basic ingredients and you can make a bunch more. Plus you can tweak them the way you like. It's more work, but it can be a lot more fun and it frees you up to do things you can't do with pre-packaged mixes. If that concept appeals to you, then buy this book. Anchell starts by breaking down the basic chemical baths of B&W work, developer, stop and fixer, and discusses how each work. He discusses the various chemicals that go into them and how they each affect the bath. And finally he winds up with a number of recipes so you can make any number of things and try them out. Granted, developer (and other types of) formulas are easily found elsewhere and are all over the internet. But the front of the book where he discusses the whys and wherefores are what makes this book golden. It's one thing to follow a recipe blindly, it's another to understand why adding more sodium carbonate is going to change the blacks on the print, or why a given developer lets you shoot Tri-X and E.I. 800 while another drags you down to 125. Unlike the few other books that tackle the subject, this one's very lucid, engaging, and well written. You don't have to be a chemist to understand it, but if you enjoyed playing with a chemistry set when you were a kid (or as an adult with your kid's set), you'll pick this up quickly and easily. Highly recommended. Sadly, this may turn out to be the most obsolete book here, even though my copy is from 1997. 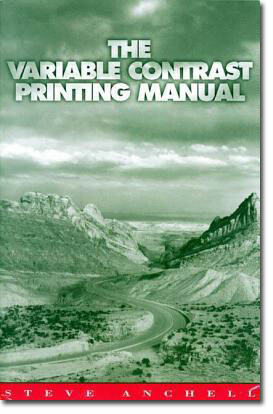 I'm not sure if you can even get variable-contrast (VC) paper anymore from anybody. For the uninitiated, darkroom printing papers typically have a fixed contrast curve. The amount of light that hits a spot on the paper determines how dark the spot will be; a little bit of light will yeild a light gray spot, a lot of light will yeild a dark gray spot. To understand contrast, think of amounts of light that are varied by time; a little bit of light comes from a short exposure (say 1 second); a lot more light from a longer exposure (say 10 seconds). Contrast is how much the paper reacts to differences in exposure time; a low contrast paper (soft) might show only a little difference in grays between a 1 and 10 second exposure difference; a high-contrast paper (hard) might render as pure white and pure black. Prior to around the 1970s, you had to buy different "grades" of contrast and pick the one you wanted to give you the image you needed; sometimes you might need a soft Grade 0 or 1, sometimes you might need a hard Grade 4. Then VC paper really hit the mainstream and suddenly you had all the grades but you only had to keep one stock of paper. They did it by having two emulsions, one that was sensitive to blue light and the other to green (single contrast papers were only senstive to blue); one emulsion was high contrast and one was low, so you could manipulate and bias them depending on how you filtered the light. If you filtered so that the high contrast layer "sees" a lot of light and the low contrast layer was mostly blind, you got a high contrast layer. VC papers had their detractors, but I loved them (Polymax was wonderful) and you could do a lot of interesting things with them. If you were interested in masking, you could make multiple exposures with different contrast filters, thus solving a lot of local contrast problems. Photoshop has mostly done away with all that. I don't know, folks—I've got the 19th edition from 1967 (the first was in 1939), so you'd think this is a classic, "The Great Gatsby" of photo books. Yet I have the only copy I've ever seen for sale and I've never seen it referred to in other sources. Go figure. This is quite a tome of a book; at over 500 pages it's thicker than most books of photography-in-general are, let alone darkroom work. 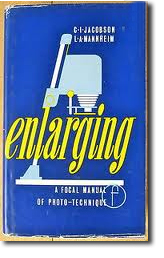 What you get are serious discussions of negatives, papers, enlargers, how to set up a darkroom, how to use different kinds of enlargers, using exposure meters, B&W and color work, and on and on. The bad part is that it's dry as dust, about as interesting to read as a scholarly paper on a subject you care and know nothing about. If you can slog through it, there's plenty to learn. I think Ansel Adams's The Negative and The Print are far better written and will give you a lot of useful information, but I don't think anyone else offers everything that's in this book. Worth it if you can find an inexpensive copy. This slim volume is long out of print but shows up at the used bookstores from time to time. It's out of date—my 7th edition is from 1967; I believe the most recent edition is the 8th. Yet much of the information is still usefu if you're doing darkroom workl. It is a very readable, useful book. If you find a copy at a used bookstore or photo shop or library, get it. As I type this, Amazon.com has it for sale (though one of it's sellers) for a penny ($4 after shipping). This is a great book if you're familiar with darkroom work but haven't really mastered it yet; or you've mastered the basics but you want to open the door to more possibilities. Besides all the standard stuff, Lootens describes a variety of techniques that go the next step: pre-flashing paper, masking and retouching, and my favorite—how to tinker with standard developers to tweak their behaviors. 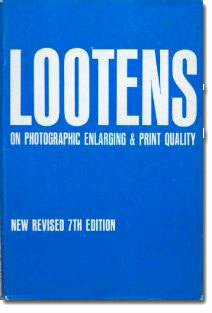 I haven't seen the early editions, but this one ("edited and enlarged" by Lester Bogen) is clear and well-written.